Black brothers, Black sisters, i want you to know that i love you and i hope that somewhere in your hearts you have love for me. 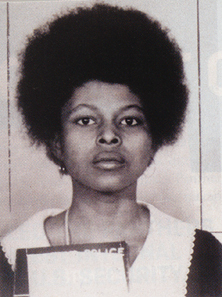 My name is Assata Shakur (slave name joanne chesimard), and i am a revolutionary. A Black revolutionary. By that i mean that i have declared war on all forces that have raped our women, castrated our men, and kept our babies empty-bellied. I have declared war on the rich who prosper on our poverty, the politicians who lie to us with smiling faces, and all the mindless, heart-less robots who protect them and their property. I am a Black revolutionary, and, as such, i am a victim of all the wrath, hatred, and slander that amerika is capable of. Like all other Black revolutionaries, amerika is trying to lynch me. I am a Black revolutionary woman, and because of this i have been charged with and accused of every alleged crime in which a woman was believed to have participated. The alleged crimes in which only men were supposedly involved, i have been accused of planning. They have plastered pictures alleged to be me in post offices, airports, hotels, police cars, subways, banks, television, and newspapers. They have offered over fifty thousand dollars in rewards for my capture and they have issued orders to shoot on sight and shoot to kill. I am a Black revolutionary, and, by definition, that makes me a part of the Black Liberation Army. The pigs have used their newspapers and TVs to paint the Black Liberation Army as vicious, brutal, mad-dog criminals. They have called us gangsters and gun molls and have compared us to such characters as john dillinger and ma barker. It should be clear, it must be clear to anyone who can think, see, or hear, that we are the victims. The victims and not the criminals. It should also be clear to us by now who the real criminals are. Nixon and his crime partners have murdered hundreds of Third World brothers and sisters in Vietnam, Cambodia, Mozambique, Angola, and South Africa. As was proved by Watergate, the top law enforcement officials in this country are a lying bunch of criminals. The president, two attorney generals, the head of the fbi, the head of the cia, and half the white house staff have been implicated in the Watergate crimes. They call us murderers, but we did not murder over two hundred fifty unarmed Black men, women, and children, or wound thousands of others in the riots they provoked during the sixties. The rulers of this country have always considered their property more important than our lives. They call us murderers, but we were not responsible for the twenty-eight brother inmates and nine hostages murdered at attica. They call us murderers, but we did not murder and wound over thirty unarmed Black students at Jackson State—or Southern State, either. They call us murderers, but we did not murder Martin Luther King, Jr., Emmett Till, Medgar Evers, Malcolm X, George Jackson, Nat Turner, James Chaney, and countless others. We did not murder, by shooting in the back, sixteen-year-old Rita Lloyd, eleven-year-old Rickie Bodden, or ten-year-old Clifford Glover. They call us murderers, but we do not control or enforce a system of racism and oppression that systematically murders Black and Third World people. Although Black people supposedly comprise about fifteen percent of the total amerikkkan population, at least sixty percent of murder victims are Black. For every pig that is killed in the so-called line of duty, there are at least fifty Black people murdered by the police. Black life expectancy is much lower than white and they do their best to kill us before we are even born. We are burned alive in fire-trap tenements. Our brothers and sisters OD daily from heroin and methadone. Our babies die from lead poisoning. Millions of Black people have died as a result of indecent medical care. This is murder. But they have got the gall to call us murderers. They call us kidnappers, yet Brother Clark Squires (who is accused, along with me, of murdering a new jersey state trooper) was kidnapped on April z, 1969, from our Black community and held on one million dollars' ransom in the New York Panther 21 conspiracy case. He was acquitted on May 13, 1971, along with all the others, of 156 counts of conspiracy by a jury that took less than two hours to deliberate. Brother Squires was innocent. Yet he was kidnapped from his community and family. Over two years of his life was stolen, but they call us kidnappers. We did not kidnap the thousands of Brothers and Sisters held captive in amerika's concentration camps. Ninety percent of the prison population in this country are Black and Third World people who can afford neither bail nor lawyers. we who rip off billions of dollars every year through tax evasions, illegal price fixing, embezzlement, consumer fraud, bribes, kickbacks, and swindles. They call us bandits, yet every time most Black people pick up our paychecks we are being robbed. Every time we walk into a store in our neighborhood we are being held up. And every time we pay our rent the landlord sticks a gun into our ribs. They call us thieves, but we did not rob and murder millions of Indians by ripping off their homeland, then call ourselves pioneers. They call us bandits, but it is not we who are robbing Africa, Asia, and Latin America of their natural resources and freedom while the people who live there are sick and starving. The rulers of this country and their flunkies have committed some of the most brutal, vicious crimes in history. They are the bandits. They are the murderers. And they should be treated as such. These maniacs are not fit to judge me, Clark, or any other Black person on trial in amerika. Black people should and, inevitably, must determine our destinies. Every revolution in history has been accomplished by actions, al-though words are necessary. We must create shields that protect us and spears that penetrate our enemies. Black people must learn how to struggle by struggling. We must learn by our mistakes. I want to apologize to you, my Black brothers and sisters, for being on the new jersey turnpike. I should have known better. The turnpike is a checkpoint where Black people are stopped, searched, harassed, and assaulted. Revolutionaries must never be in too much of a hurry or make careless decisions. He who runs when the sun is sleeping will stumble many times. Every time a Black Freedom Fighter is murdered or captured, the pigs try to create the impression that they have quashed the movement, destroyed our forces, and put down the Black Revolution. The pigs also try to give the impression that five or ten guerrillas are responsible for every revolutionary action carried out in amerika. That is nonsense. That is absurd. Black revolutionaries do not drop from the moon. We are created by our conditions. Shaped by our oppression. We are being manufactured in droves in the ghetto streets, places like attica, san quentin, bedford hills, leavenworth, and sing sing. They are turning out thousands of us. Many jobless Black veterans and welfare mothers are joining our ranks. Brothers and sisters from all walks of life, who are tired of suffering passively, make up the BLA. Liberation Army at this time is to create good examples, to struggle for Black freedom, and to prepare for the future. We must defend ourselves and let no one disrespect us. We must gain our liberation by any means necessary. WE WILL BE FREE! WE WILL BE FREE ! IN THE SPIRIT OF MARTHA PITTS LET US CARRY THIS STRUGGLE ON!